St. Louis, MO - April 17, 2008 - Amdocs Limited (NYSE: DOX) today reported that for the quarter ended March 31, 2008, revenue was $774.3 million, an increase of 9.6% from last year's second quarter. 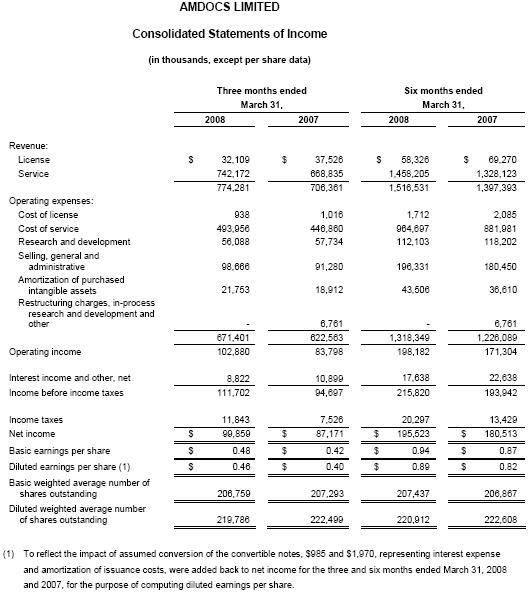 Net income on a non-GAAP basis was $126.6 million, or $0.58 per diluted share (excluding acquisition-related costs, which include amortization of purchased intangible assets, and excluding equity-based compensation expense, net of related tax effects, of $26.8 million), compared to non-GAAP net income of $114.5 million, or $0.52 per diluted share, in the second quarter of fiscal 2007 (excluding acquisition-related costs, which include amortization of purchased intangible assets, in-process research and development write-off and other, and excluding restructuring charges and equity-based compensation expense, net of related tax effects, of $27.3 million). The Company's GAAP net income was $99.9 million, or $0.46 per diluted share, compared to GAAP net income of $87.2 million, or $0.40 per diluted share, in the second quarter of fiscal 2007. 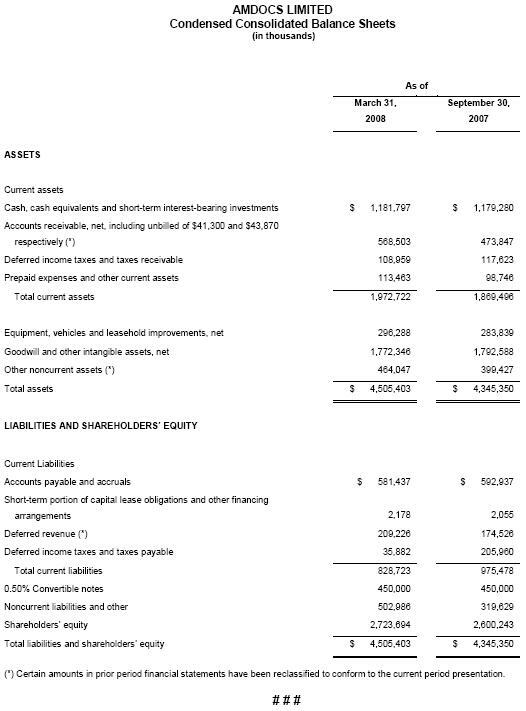 Free cash flow for the quarter was $63.1 million, comprised of cash flow from operations of $97.3 million less $34.2 million in net capital expenditures and other. "We are pleased to report that we have exceeded our plans for this quarter and for the first half of fiscal 2008," said Dov Baharav, chief executive officer of Amdocs Management Limited. "Our strong results are driven by an expansion of our managed services business and by expanding our implementations of mission-critical systems in both developed and emerging markets. We recognize that there is uncertainty in the market as economic conditions have become more challenging and we believe that our forecasts for the second half of this fiscal year take this into account. Our customers recognize that Amdocs systems including our new CES 7.5 offering can help them to increase revenue and reduce costs; the result for Amdocs is greater customer commitments and a strong pipeline of potential business. We continue to see demand for projects supporting new initiatives as well as from projects focused more on cost savings, including managed services opportunities, and we look forward to continued growth in the second half of fiscal 2008." In the second quarter Amdocs had numerous wins across lines of business and geographies. The Company continued to show progress in the operational support systems (OSS) area by winning a strategic deal with a large North American service provider. In Europe, Amdocs signed an important CRM deal with a large wireless carrier to help them improve their customer experience. The Company had several wins with wireless carriers including a consulting engagement to help a service provider introduce new, innovative offerings. Amdocs won several new deals in emerging markets based on the Amdocs Compact Convergence Suite. Amdocs is continuing to expand and strengthen its position in the broadband cable and satellite market with several wins and a recent acquisition. In addition to the wins noted above, a large broadband cable operator in North America has chosen Amdocs to provide self-service capabilities including an eBill presentment and payment solution. The Company also won service projects related to requirements scoping, which can be the initial phase of system transformation. Shortly after the end of the quarter, Amdocs announced the acquisition of Jacobs Rimell in order to expand its capabilities in OSS for broadband. Amdocs expects that revenue for the third quarter of fiscal 2008 will be approximately $790-$805 million. Diluted earnings per share on a non-GAAP basis for the third quarter are expected to be $0.59-$0.61, excluding acquisition-related costs and approximately $0.06-$0.07 per share of equity-based compensation expense, net of related tax effects. 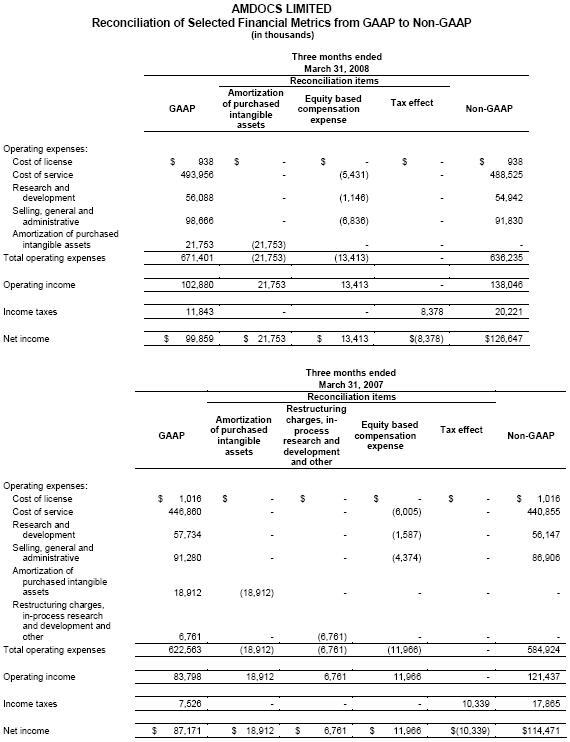 Diluted GAAP EPS is expected to be approximately $0.45-$0.48, without taking into account potential purchase price adjustments relating to the acquisition of Jacobs Rimell in April 2008. Updated fiscal 2008 guidance: Expected revenue of approximately $3.09-$3.15 billion and diluted non-GAAP EPS of $2.31-$2.37, excluding acquisition-related costs and approximately $0.21-$0.24 per share of equity-based compensation expense, net of related tax effects. Diluted GAAP EPS is expected to be approximately $1.81-$1.90, without taking into account potential purchase price adjustments relating to the acquisition of Jacobs Rimell in April 2008. 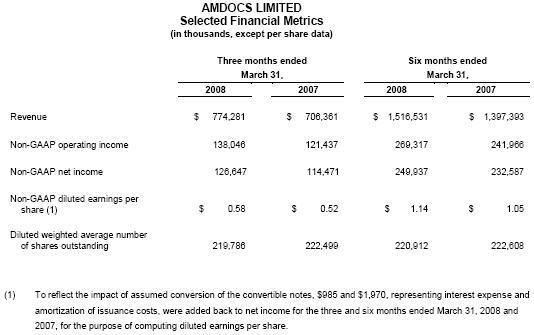 Amdocs will host a conference call on April 17, 2008 at 5 p.m. Eastern Time to discuss the Company's second quarter results. The call will be carried live on the Internet via www.InvestorCalendar.com and the Amdocs website, www.amdocs.com. This press release includes information that constitutes forward-looking statements made pursuant to the safe harbor provision of the Private Securities Litigation Reform Act of 1995, including statements about Amdocs growth and business results in future quarters. Although we believe the expectations reflected in such forward-looking statements are based upon reasonable assumptions, we can give no assurance that our expectations will be obtained or that any deviations will not be material. Such statements involve risks and uncertainties that may cause future results to differ from those anticipated. These risks include, but are not limited to, the effects of general economic conditions, Amdocs ability to grow in the business markets that it serves, Amdocs ability to successfully integrate acquired businesses, adverse effects of market competition, rapid technological shifts that may render the Company's products and services obsolete, potential loss of a major customer, our ability to develop long-term relationships with our customers, and risks associated with operating businesses in the international market. Amdocs may elect to update these forward-looking statements at some point in the future; however, the Company specifically disclaims any obligation to do so. These and other risks are discussed at greater length in the Company's filings with the Securities and Exchange Commission, including in our Annual Report on Form 20-F for the fiscal year ended September 30, 2007 filed on December 3, 2007 and on Form 6-K furnished on February 11, 2008.